Growing up in Zion, Mesa Verde, Petrified Forest and Grand Teton national parks, Fred J. Fagergren listened to his father, Fred C. Fagergren, his uncle, Russ Mahan, and many park rangers and naturalists as they shared stories of the early park rangers. They spoke of the importance of preserving park resources, as well as the need for rangers to stand fast in protecting those special places for future generations. 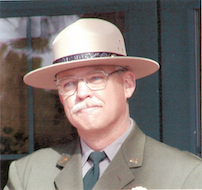 Fagergren ultimately pursued his own National Park Service (NPS) career, serving 28 of his 34 years in the Service as a park superintendent. He began as a seasonal park ranger at Chiricahua National Monument (NM) and Saguaro National Park (NP) and also worked at Rocky Mountain NP, Florissant Fossil Beds NM and Bent’s Old Fort National Historic Site. He spent time in the National Capital Parks in Washington, D.C., and then returned to the field at Effigy Mounds NM as chief ranger for resource management and interpretation. His first superintendency was at Mound City Group NM. In 1981, Fagergren became the first superintendent of Big Cypress National Preserve in South Florida. The enabling legislation for Big Cypress provided a strong legal basis for resource protection and directed that the pre-existing consumptive uses were to occur only to the extent proven to be compatible with protection of the preserve’s resources. Using that authority, he made steady and significant changes. Through continuous attention to the issue of the 500 existing trespass camps and a court case which confirmed the camps were an adverse impact to preserve resources, Fagergren and his staff removed the remaining trespass camps. In addition, during his ten year tenure, he obtained the first major hunting regulation changes for the preserve, eliminated hunting dogs, and initiated major checks and balances such as quota permits. He and his staff also gave the ongoing oil and gas exploration and development increased attention. They gave the proposals they received complete and careful review, which resulted in more off-set drilling and completely self-contained operations to protect critical resources. When a major seismic survey was proposed over several hundred miles using off-road vehicles, his insistence on an environmental impact statement ultimately prevailed. Fagergren recognized that the many challenges facing the preserve could not be resolved without an effective General Management Plan (GMP). Big Cypress would be managed with a priority on protection of the unique resources and consumptive uses would occur only as proven to be compatible with resource protection. The GMP was approved and although Fred moved on to his final superintendency at Bryce Canyon NP, his knowledge of the preserve, its legislation, and the GMP resulted in his continued regular involvement with Big Cypress issues. He repeatedly emphasized that Big Cypress was created to protect critical resources while allowing for certain uses to the extent they are compatible with resource protection. Interestingly, Fagergren concluded his NPS career in 2002 at Bryce Canyon NP where his father began in 1934. He continued his emphasis on resource protection even in the face of ever increasing visitation and the demand for expanded development.